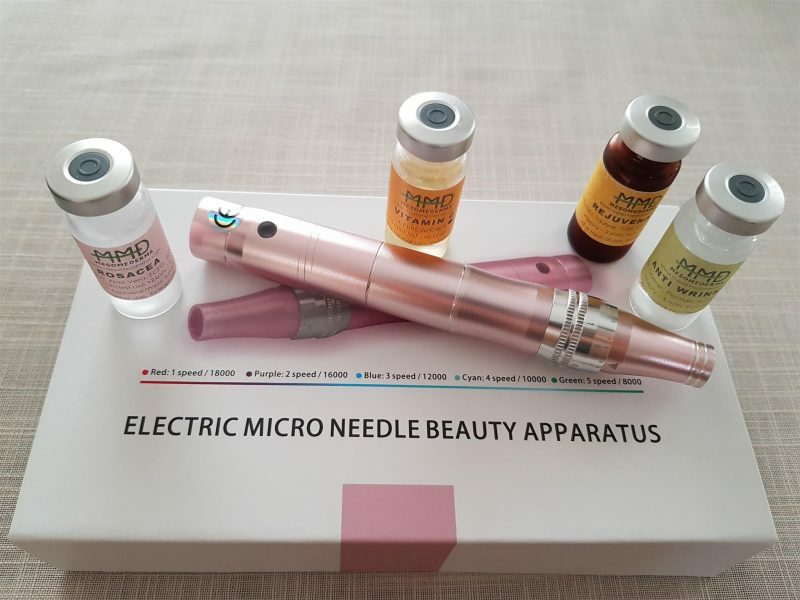 A very popular rejuvenating cosmetic procedure (also known as a Collagen Induction Therapy) that involves the use of the micro needling pen that has fine, sterile needles to repeatedly create very small puncture wounds in the top layer of the skin. This treatment is very effective since it exhilarates our skin’s natural cell turnover resulting in an increased amount of collagen and elastin production. Micro-needling is nearly painless with less downtime anti-aging procedure that reverses and prevents the signs of aging. This procedure is effective to treat from hyperpigmentation, sun damage, melasma, fine lines and wrinkles, scars, acne scars, stretch marks, dry/oily skin, and thinning/uneven skin. Let’s Stop the Aging in its tracks! If you are suffering from deep acne scars, deep wrinkles, severe pigmentation and would like to see substantial results you will require more sessions from deeper treatments every 4 to 6 weeks. For mild treatments and more sensitive skin the treatment can be repeated every 2 to 4 weeks. The intensity of the treatment will guide the frequency of the treatments. Microneedling treatment itself is 30 mins but be ready to spend 1 hr at the spa as we will go through brief consultation, take before and after pictures, cleanse and at the end of the treatment, the client’s skin will be infused with serums as well as nurturing and hydrating mask. Rejuvenate and stimulate your collagen with Skinnovations Medical Spa! A very popular rejuvenating cosmetic procedure (also known as a Collagen Induction Therapy) that involves the use of the micro needling pen that has fine, sterile needles to repeatedly create very small puncture wounds in the top layer of the skin. This treatment is very effective since it exhilarates our skin’s natural cell turnover resulting in increased amount of collagen and elastin production. Skinnovations Medical Spa will use a topical anesthetic to help the client with the comfort level of this treatment. Slight bleeding might occur during the treatment but not ongoing as well as, the skin might feel tender as if sunburned. It reverses and prevents the signs of anti-aging as well as, effective against treating hyperpigmentation, sun damage, melasma, fine lines and wrinkles, scars, acne scars, stretch marks, dry/oily skin and thinning/uneven skin. What are microneedling side effects? Redness and swelling are expected after the treatment but will disappear closer to the 3rd day. The intensity of the treatment will guide the frequency of the treatments. If you are suffering from deep acne scars, deep wrinkles, severe pigmentation and would like to see substantial results you will require more sessions from deeper treatments which will be every 4 to 6 weeks. For mild treatments and more sensitive skin, the treatment can be repeated every 2 to 4 weeks. At least 3 to 6 treatments are required to achieve great results. Depth of the treatment plays a big role in how long the recovery will be but usually avoiding the sun exposure is recommended for 24-48 hours post-treatment. Most patients describe the immediate post-treatment period as having a sunburn. Microneedling with PRP (Platelet-rich plasma) is a method of applying whole blood to the skin while microneedling. It is very effective in creating more tightness in the skin and speeds up the healing process along.